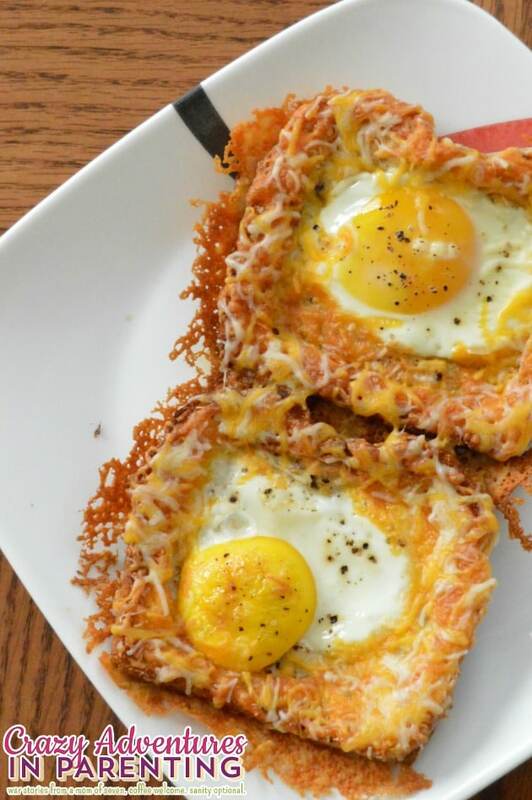 This Cheesy Baked Egg Toast recipe is a cheesy take on an “Egg in a Hole” breakfast. I hope you decide to try it for a fun breakfast for your family! Eggs and toast are such a perfect breakfast staple. They’re our default, our ‘go-to’ breakfast, especially if you’re like me and love a good runny egg with a little buttered toast to mop it up with. Mmm! But I wasn’t always a runny egg fan. In fact, I preferred scrambled as a child, especially with cheese. Cheesy scrambled eggs were my thing, man. Until that one fateful day, a line cook made me an “over easy” egg sandwich for breakfast. From that day forward, “over easy” eggs were my jam. Check out more of our family-friendly breakfast recipes! I try to add a little cheese to my kids’ egg breakfasts whenever I can, because it tastes good and I recall my fondness for cheesy eggs as a child. One morning recently, it hit me, since now all my kids love “over easy” eggs, too, why not try making this cheesy baked egg toast? Why not turn the traditional egg-in-a-hole toast recipe on it’s head with delicious cheese? And make a portable yet flavorful breakfast for them like this? Isn’t it so pretty? It tastes just as good as it looks. Find out how to make this recipe with a sheet pan with my Sheet Pan Cheesy Baked Egg Toast recipe! On a plate, press your spoon into the bread, making a rectangle, as demonstrated below. I prefer using a pointy-tipped iced tea spoon, because it makes great corners, but if you don’t have one, a butter knife will do. Season the top of the egg. Gently spread butter around the edges being careful not to touch the raw egg. Sprinkle your shredded cheese around the edges onto the butter. Place your cheesy egg bread onto your baking plate, toaster oven, or into your covered medium skillet (whichever you choose), and cook for about ten minutes, watching carefully to ensure it doesn’t burn and that the egg is cooked. You can choose to add a little more cheese again at the end before serving, if you’d like. Will you just LOOK at THAT!? Cheese toast that just got an egg makeover! Yes! That baked on cheese, that beautifully seasoned egg. Baked egg in a hole with cheese, baby! Eat it with a knife and fork or pick it up like a regular piece of toast, just be sure to savor every bite. The full recipe instructions are below, but if you want to want to prepare this in bulk, check out my Sheet Pan Cheesy Baked Egg Toast recipe! While you’re here, if you LOVE tasty egg recipes, check some of these out! 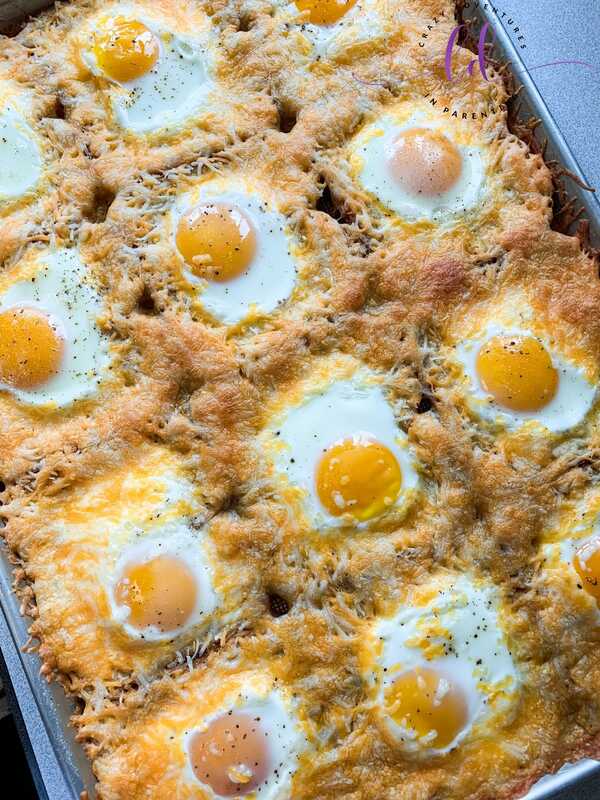 Easy and delicious, this Cheesy Baked Egg Toast is a new take on baked egg-in-a-hole. It's toasty, cheesy, and gives you a perfect simple breakfast! To prepare this Cheesy Baked Egg Toast in bulk, check out our Sheet Pan Cheesy Baked Egg Toast recipe! Isn’t this recipe wonderful? Now that you see how to make this glorious Cheesy Baked Egg Toast, be sure to pin it below! Or if you’re looking to prepare a lot of it at once, check out our Sheet Pan Cheesy Baked Egg Toast recipe!